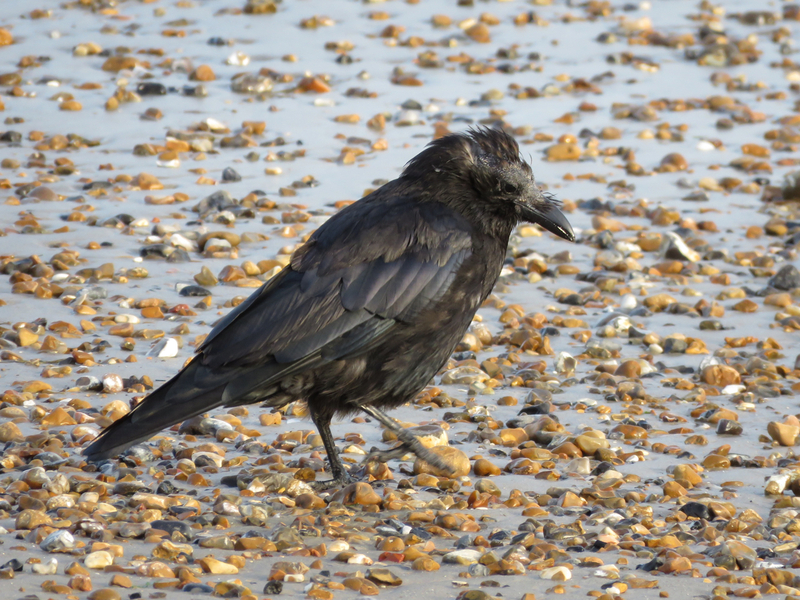 Crows are opportunistic and generalist feeders and live in a wide diversity of habitats, from woods and cities to the sea shore. They have to go through a period of learning from their parents how to forage, in particular about the best way to obtain resources for each habitat. 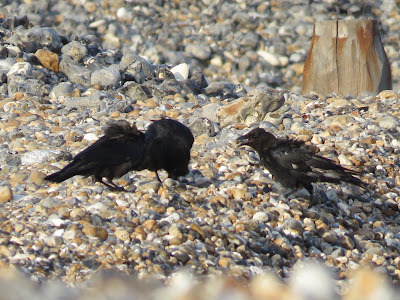 I've been staying by the sea on the south coast on the UK for a few days, and I've spent a fair amount of time watching a family of Carrion Crows with three young. 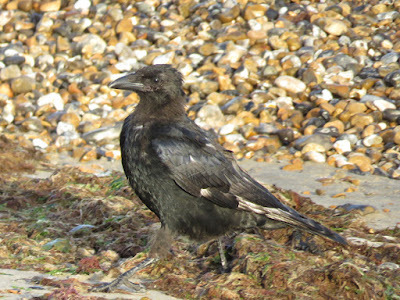 They often feed on the beach, visiting especially at low tide. The young appear capable of finding their own food, but they still regularly beg for food from their parents. The beach crows probably get live invertebrates beachcombing from the tideline, but they will also scavenge wash out crabs or fish, in competition with the local gulls. 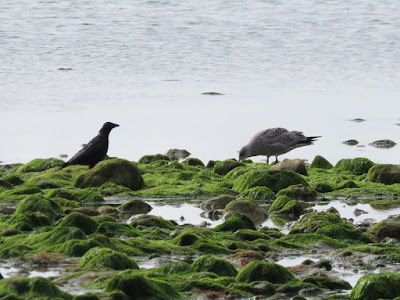 The adults, although tolerating the young nearby and allowing them to follow and watch what they eat, lunge to them aggressively if they are harassed too much. Two of the young flanking one of the adults, note the size difference. 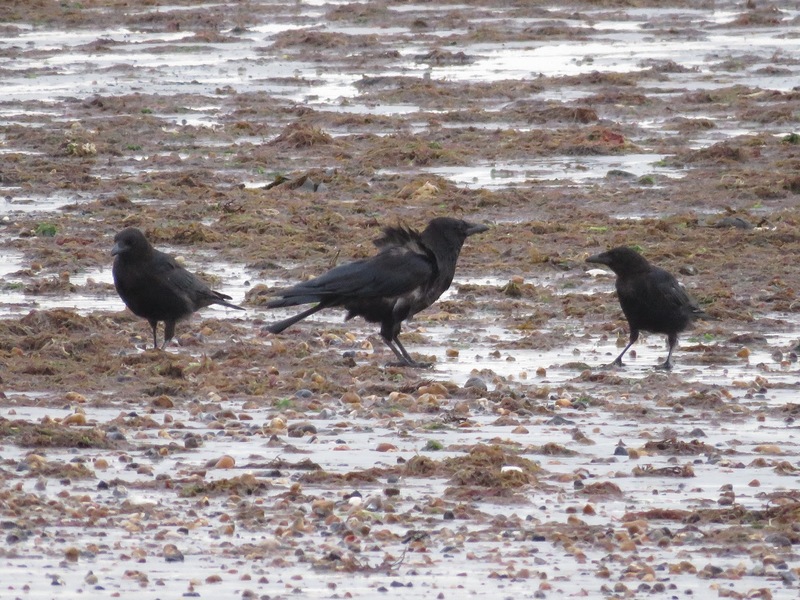 The adults are moulting and are, to put it mildly, not looking at their best. 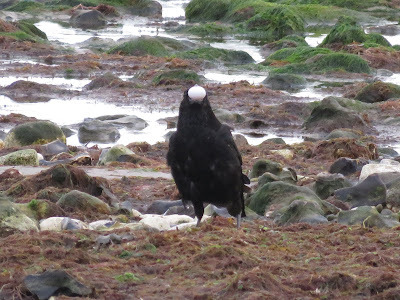 One of them is almost bald: many instances of sticking their face into the open bill of their nestlings (if, as I presume, it's the male, he will have also fed the incubating female) for a few weeks during the breeding season have taken its toll on its head feathers. The bald adult, possibly the male. Young are smaller than the adults, with legs that look long for their bodies and wing feathers that are not fully grown. They have a brown sheen to their head feathers and have pink mouths, obvious when they beg. This one has also some wing feather discolouration probably due to some nutritional deficiency. The young, on the right, begs for food from both adults. 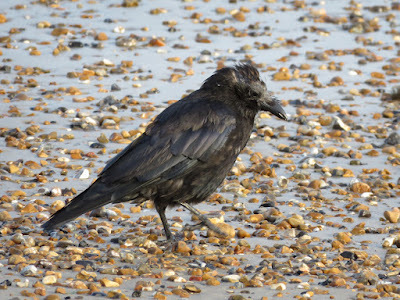 The young crows spend some time away from their parents, walking on the beach, picking seaweed or turning a little stone to peck underneath. Young crow watching a young Herring gull, from the family they share the beach with. 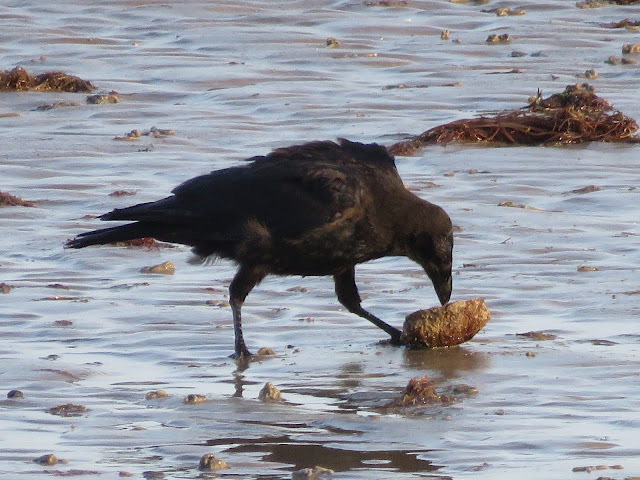 One of the young crows picked on the empty shell of a spider crab demonstrating its deft foot use (above). Another got a small crab this morning, and a Herring gull chased him. The crow persevered and ate his crab. But as soon as one of the adult crows gets something, the young crowd around. What a lovely video. Crows are endlessly fascinating. The Ringed Plover in the background seemed equally interested by the spectacle. Thank you Ralph. I hadn't noticed the Ringed Plover, I had to watch the video again to spot it, they are so well camouflaged some times! Wonderful little video - poor thing, getting no peace to eat her egg!